Fueled by adrenaline, coffee and a full breakfast, we quickly fell into pace on the smooth trail leading into Big Bend Ranch State Park from the East Contrabando trailhead at the southeastern corner of the park, near the Barton Warnock Visitor’s Center and the town of Lajitas. Soundless except for the buzz of our wheels, we rode the first hour through lush stands of mesquite and creosote as the East Main Trail unfurled before us like a desert carpet, leading northward toward Fresno Canyon into a majestic world of mountains, arroyos and springs. 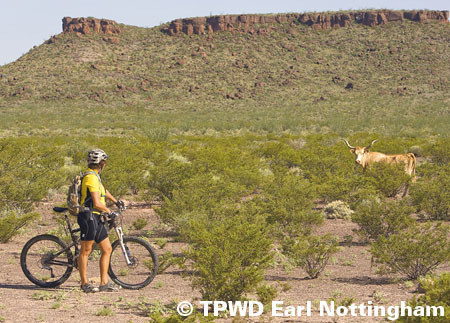 We had just launched a two-day bike adventure from Lajitas across the park and back through Fresno Canyon, which was opened to the public in 2008 thanks to the TPWD’s purchase of the Fresno Ranch in-holdings with the help of The Nature Conservancy. “Having access to Fresno Canyon is a significant gain for bikers and other outdoor enthusiasts who want to spend extended time in remote areas of the park,” Dan explained. 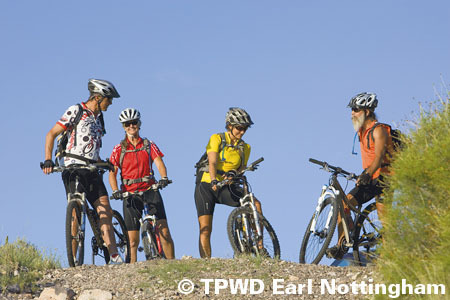 “It’s possible to create longer trip itineraries using Fresno Canyon as a natural north-south corridor to connect with the Rancherias, Solitario, Contrabando and Oso Loop trails.” The acquisition has also allowed the opening of new backcountry trails and campsites. The park’s reservation system makes it easy to plan multi-day trips because (unlike at many parks) you can reserve specific campsites in advance. 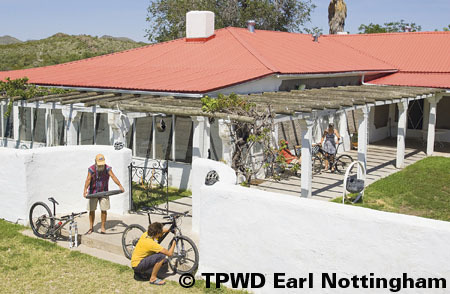 For those wanting an occasional bed and shower, two lodging options are available by advance reservation at the Sauceda Ranger Station complex at park headquarters — the Big House, a sprawling adobe ranch house that sleeps eight, and Sauceda bunkhouse, which sleeps 30. Public restrooms and bike rentals are also available. Eight miles from the trailhead, we moved into the rugged terrain of lower Fresno Canyon. I was struck by its remote beauty and the cultural reminders of the Native Americans, Spanish explorers, ranchers and cinnabar miners who came before. 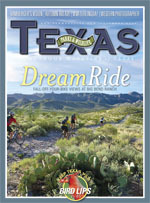 “The East Main Trail, which becomes a four-wheel-drive road in the upper reaches of Fresno Canyon, at one time connected the Lajitas/Terlingua mining district to the rail lines at Marfa,” David explained. Along the road through Fresno Canyon there are junctures with other historic roads that once carried supplies and passengers to and from Fresno Canyon. 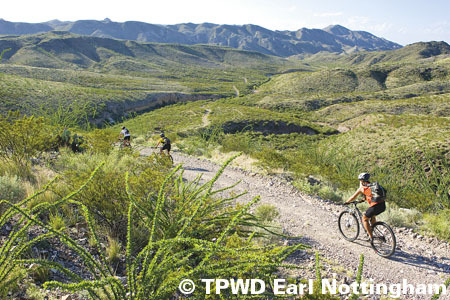 TPWD planners are gradually retracing these old roads and converting them to multi-use trails. We stopped briefly to peer down the shaft of the now-defunct Whit-Roy cinnabar mine on the right. Across the trail we admired the imposing Wax Factory Laccolith, a natural cliff-like formation named for the former Fresno wax factory, where candelilla plants were processed to make wax for waterproofing military supplies during World War I. The laccolith resembled a rock-layer sandwich piled ever higher toward the sky, as if stacked over time by some orderly chef of nature. At 10.6 miles, we marveled at Red Rock, a tall, striking, red boulder in the creek bed. Upstream we reveled in the tall, sheltering cottonwoods of Fresno Falls, a beautiful oasis near the convergence of Fresno Creek with Arroyo Primero. Here, the pebbly creek bed gives way to smooth, water-worn rock etched deeply by the creek. Archaeological rock shelter and bedrock mortar sites indicate this was a gathering place for Native Americans thousands of years ago. I thought about how the treasured places that we enjoy today were enjoyed by others over time for similar reasons — proximity to water, shade and natural rock “shelves” for sitting or working. As lunchtime approached, I craved electrolyte replenishment. We biked two more miles and stopped to wait for David at our designated lunch spot near the Crawford-Smith Ranch site, where in the 1920s the James L. Crawford family planted citrus orchards, raised goats and operated the Fresno Canyon wax factory. Motorized vehicle access through the ranch site is not permitted; SAG drivers can only reach the Crawford-Smith Ranch site from the north, through Sauceda. To be honest, I had some doubts that David would find us, due to a slight wrinkle in logistics involving a “Y” in the road and a cryptic note left under a rock about a mile back. If it had been up to me, I would have been on the satellite phone immediately to make sure he knew where we were, but these guys have their own style of communicating in the backcountry that is somewhat akin to mind-reading. Just as I started to worry, we heard the distant rumble of David’s vehicle, and he materialized before us bearing burritos, cold water and much-welcomed Gatorade. After lunch, the real challenge began. We biked the hills through upper Fresno Canyon, past a series of campsites with fall-off-your-bike views in every direction. Jutting upward to the northeast were the brooding flatirons of El Solitario, a 10-mile-wide eroded dome containing a volcanic crater, with a killer bike loop around its perimeter. Los Portales, a cavelike “eye” in the side of a grayish flatiron, watched us balefully as we traveled past the west side of the Solitario rim. 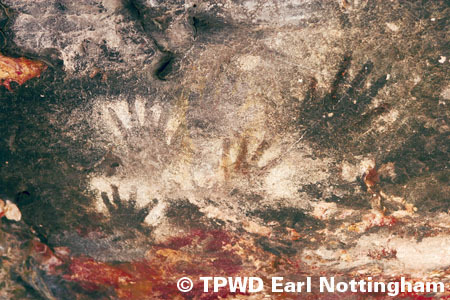 We stopped briefly at a Native American rock shelter site, Manos Arriba (Hands Up), to marvel at the ancient pictographs of upward-turned handprints on the rock ceiling. We settled in for the three-mile Fresno Hill “mountain stage.” As I propelled my bike forward, the slow burn became an endorphin rush and I felt ecstatic and all-powerful. Unfortunately, I was not actually any faster. Dan patiently joined me when I dismounted and walked the rest of the way up the hill, where at the top we were rewarded with an unforgettable vista. We had gained 1,800 feet, and the air was cooler here. We sped along the last few miles to Sauceda, where we settled in for the evening at the Big House and enjoyed its large kitchen, dining area and screened-in porch. It was the perfect place to rest before another full day of biking and to perform a little bike maintenance, including repairing a cactus-caused flat tire. The next morning, after a hearty breakfast at the bunkhouse, we biked south out of Sauceda along Madrid Road through a mesquite- and creosote-filled Eden waking to the sun’s early rays. We fell into a moving meditation as we hummed along the trail, easing into the day. Six miles from Sauceda, we began a rocky descent down the backside of Madrid Hill. The world opened before us, and we were awed by one stunning vista after another. From the Vista del Chisos campsite, we could see straight into the Chisos Mountains. I was overlooking a critical factor, though — unlike the previous morning when we raced along the trail, at this moment it was 2 p.m. and 110 degrees. I quickly learned never to be tempted by a fast stretch of trail in the desert when the temperature is over 100 degrees! About five miles from the trailhead, I felt as if I were melting in a convection oven. There was no escape from the heat radiating upward from the limestone and downward from the sky. I wanted to rest for five minutes in the shade, but there was none to be seen, only stoic mesquite everywhere filtering and absorbing the sun, and magic purple hills wavering mirage-like in the distance. Dan’s early advice hovered like a thought bubble in the hot air: “Start slow, and then taper off.” I noticed him eyeing me with alarm as I worked to out-bike the heat. Finally we reached the trailhead and crossed the road to relax in the air-conditioning at the Barton Warnock Center before returning to Lajitas. I felt exhausted, yet fully awake. 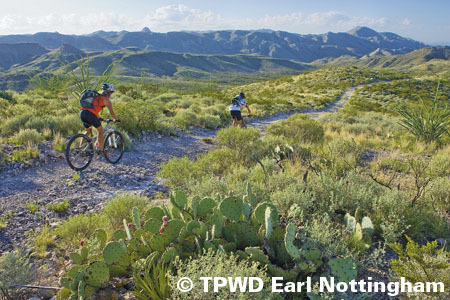 Big Bend Ranch State Park has that effect on you: it’s unforgiving … and unforgettable.